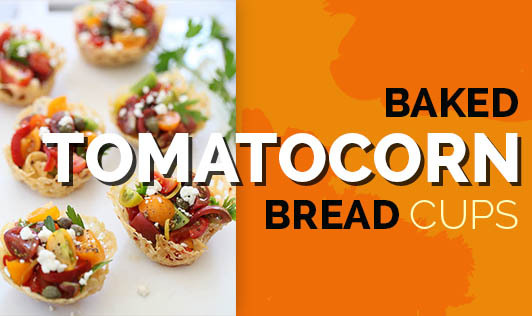 This colourful and nutritious baked tomato corn bread cups are attractive to look at and would be a good snack for your kid. 1. Remove the crust from the bread slices. 2. Wrap the bread slices in a muslin cloth and steam them for 5 to 7 minutes in a steamer. 3. Roll a little with a rolling pin and press into the cavities of a greased muffin tray. 4. Brush with melted butter and bake in hot oven at 200ºC for 10 minutes or until crisp. Keep aside. 1. Heat the oil in a pan; add onions and sauté till they turn translucent. 2. Add capsicum, tomatoes and green chillies and cook for 5 minutes over a medium flame. 3. Add corn and salt and cook for another 2 minutes. 4. Divide the filling into 12 equal portions. Keep aside.